It didn't bring snow drifts or ice but this year winter, with its chilly breezes and frosty nights, reached all the way down into the Florida peninsular like it meant business. Maybe just to remind us these colder-than-normal-seasons do come in cycles. The last one was in 1981 and some are reporting it was 1978. Needless to say several record lows have been broken. Winter has steadily delivered temperatures day after day under 60 degrees (which this gardener happens to LOVE~~for the record~~it's perfect gardening weather). This is the season I look forward to growing some varieties of flowers that in other seasons won't tolerate our heat zone. 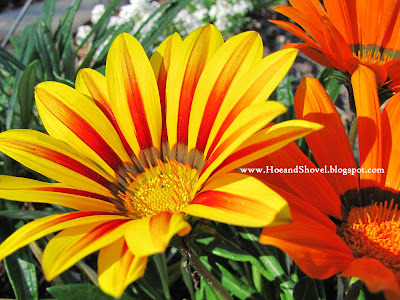 The gazanias have been faithful to brighten up the veggie garden since November. 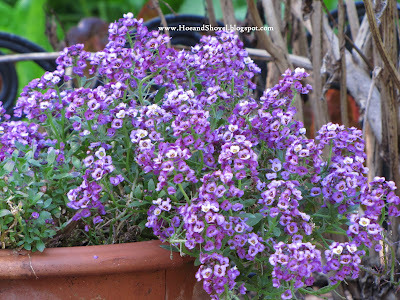 Applause to them for their exuberant colors and perky faces during the winter months. My dear blogging friends have helped me learn better how to transition in and out of the season with a more graceful attitude toward winter's frosty results. Rather than my usual response of impatience and frustration a gradual appreciation has evolved in my thinking. I can honestly say I'm learning to look at the dead and lifeless landscape with an attitude that embraces the unpredictable changes in the garden. Afterall my northern friends (anyone north of central Florida) are left to endure winter's sting in much worse ways than we ever will. This is the first winter EVER ... really... 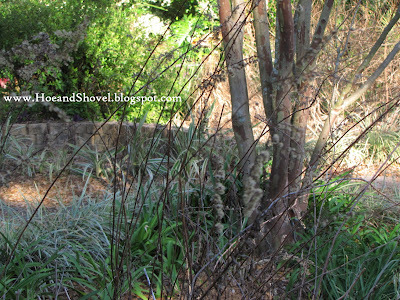 EVER that I've waited past March to prune back the dead and brittle shrubs and perennials. This year they sustained night after night of freezing temps back in January. At this point I feel even better about that decision to wait after so many subsequent cold-blast pushes our way. Even this March night... the tomatoes are covered with a freeze cloth. Not a likely or common event in March. And... this is the first winter EVER I have seen the little birdies in my garden puffed up and perched in stillness bracing against the cold. 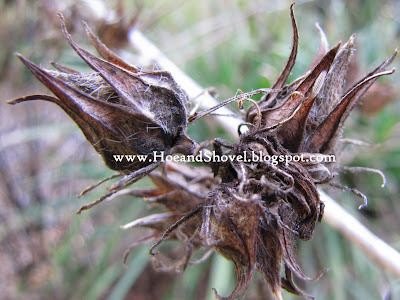 Seed heads were left on brown lifeless stalks for what my northern friends call "winter interest". A term I'd never heard of nor could have imagined prior to blogging. It's important to note here that native-born Floridians don't typically endure any amount of deadness on our flowers or plants. I guess because we can yank them out and replace them readily with new stock from our year-round garden centers. We're a little spoiled that way. Certainly the brittle branches and mangled up mush of some of my tropicals have not been the most pleasing to look at for these few months. But, truthfully, embracing this waiting period before pruning, rather than hastening to it at the first warm reprieve, has brought with it a certain peace and calmness. Accepting it for what it is and realizing there isn't anything I can do to change it. Maybe because all my energy for the last six weeks has been directed toward restoring the vegetable garden and building a new berm on the north side of the back yard I've been distracted enough with plans and designs not to get anxious over all that needs to be pruned. Regardless, the pruning hasn't been done for spring and it is March! With patchy frost predicted for the next two nights I put it off this week as well. At the very same time that winter doesn't seem to want to release its hold there are some very bright and cheery spots in the garden. I'm grateful for them as we begin the transition to spring. Maybe next week it will be time to let down our guard against these plunging temperatures and get out those pruning shears. One thing for sure ... we can now say we know what it's like for Florida to experience winter. haha, I am one of those impatient gardeners who did prunning just two weeks after the freeze! Even the cold fronts we have experiencing after the big freeze is not as bad as the Januray one, some of my sensitive plants turn brown again, such as ornamental sweet potato leaves... I feel a little impatient laterly since the plants in the garden seem just stop growing, except a few annuals :( I feel I need to go to the garden center this weekend again to buy something to cheer myself up :) I love your gazanias' brilliant color... so needed in this winter. Isn't it interesting how used to warm weather we become? It is strange to endure an extra cold winter and get a glimpse of what our northern neighbors go through. Our winter has been quite mild this year, although we have had a few extra cold ones in the past 10 years. It will be interesting to see if you garden behaves any differently when the weather does warm up then in normal years. 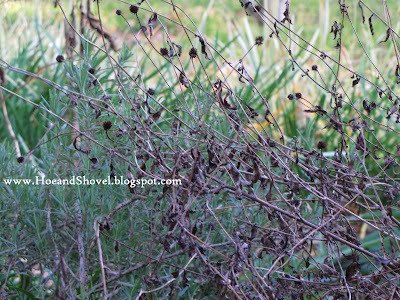 I'm wondering if the prolonged cold did more damage to your garden because your plants had less time to prepare for the sudeen cold, which might possibly make a difference. (Slowly declining temps have something to do with sugars in the cells, more complicated than I can understand). I noticed that many cycads in Tallahassee were more damaged than mine, just 50 miles north. Many plants may recover and send growth from the roots, given time. Please don't show us any more winter interest. Treasure the bright spots. The 'sudeen cold' was a typo, not an affectation in speech. I have just been wandering Hoe & Shovel, and totally lost track of time! What a wonderful place -- the formatting, the photos (big wow! ), the information! Believe me... as I grow older along 'with' my garden patience is finally agreeing with me (in some areas). In your southern location you are probably experiencing what we 'usually' experience as far as temps and recovery. This year made everything different. We have certainly been spoiled by mild winters in Florida and I have grown to look forward to them for many reasons. What a reprieve from the humidity we are also very used to. I'm wondering the same thing you mentioned. I'll be watching closely. Somehow I knew that was a typo. I do think what you've stated has happened in the past more than this year actually. Because we had a week of cold prior to the plunge to freezing I think the plants were better acclimated than years prior. The difference THIS year is that we have had minimal warm-ups in between each blast of cold. It is great for getting to wear our stored sweaters and jackets that many winters hardly get any use whatsoever. Not so sure the plants feel the same way. Always nice to have a new friend to wander the garden with. I know exactly what you mean ... virtual happy places. I like to actually "be" in my garden while I'm blogging when it works out... double happy place! Yes mam we did have some frost filled mornings didn't we? Having one this morning here. I believe that the 'winter interest' of the plants is good for the garden and wildlife...although I too enjoy a good pair of pruners and tidy plants!! Your cardinal photo is beautiful! Meems, you speak the truth! It's been an unusually cold and long winter here. I'll try to adopt your embracing attitude....I'll try! I did not wait, like you, to cut back. I hope I'm not sorry, especially after last nights heavy frost. 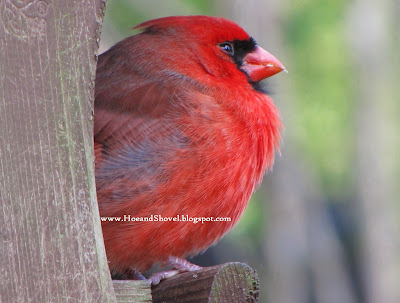 I love your little cardinal, all fluffed up to stay warm! The garden does have a way of teaching life lessons...and this winter's lesson was all about patience...a lesson I dearly do not enjoy learning, but one life repeatedly sends my way. I must confess that I'm eager for the cold weather to leave. While you seem to have learned to "gracefully embrace" the seasons, I'm still trying to learn to do so. You are right that this weather is the time to do all those heavy labor projects and leave the plants alone just a little longer. Those gazanias are so bright they look painted! I keep seeing on the news how cold it is in FL. This has been one rough winter for us all. Ah, a good pair of pruners will be enlisted in the next week or two. So much to cut away. 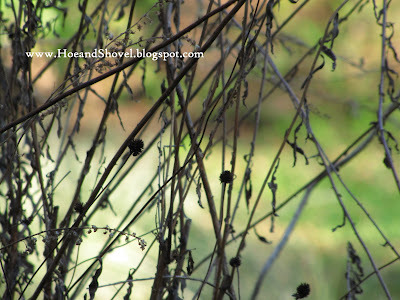 I loved the way the birdies used ALL the fried porterweed branches to sit and relax in between moving from place to place in the veggie garden this winter. The fact that your garden has been so cold is even stranger. And Ami down further on the East coast... amazing that ya'll are still dealing with this weather. Oh well, it will soon be over... surely. It sure has taken week after week to convince us this winter weather just was not going to go away. I wouldn't have believed it back in Jan. or even Feb. that it would still be around. I'm ready for some spring-like weather, too... it will be nice for the veggie garden to take off... although I DO have seeds sprouting even in this. True... it has really been hard on folks north of us I know. Meems - You are still so far ahead of us. You have an interesting perspective to adjust to this harsh winter. I just started trimming back buddleia and grasses. I didn't cut back as much as usual on the buddleia this year. The grasses barely have green shoots and I'm not sure if the muhly made it through the winter at all. The lavenders are hit and miss and uneven, I'm afraid -- but I won't give up on them until late April. You did have some very cold temperatures for central Florida! The male Northern Cardinal is a very beautiful bird! My all time favorite butterfly is the Zebra Longwing...I love your photograph on your side bar....it is a very pretty butterfly. Spring is awakening in my garden. Migration has begun...the Humming birds will be coming soon. These past few winters have really hit us hard way down here. For Florida anyway. I can remember several years in a row when we didn't reach freezing temps at all. So you just never know... and we might as well embrace it and go with it rather than moan over it... which I have done more than my share of believe me. So nice for you to know the hummingbirds are on their way. I wonder if you have seen any of the robins that hung around here for so many months this year trying to stay warm. I think the Zebra Longwing is my favorite,too. It runs a close race with the White Peacock. The flutter of the longwing is just so graceful. Our winters never last long enough in my view but typically they are more like a lovely spring rather than a true winter. This year we can only hope spring does not pass us by skipping right into summer. Hi Meems, This winter has been quite different for all of us.. We too have felt Winter's BLAST much more than usual. Our March flowers are just beginning to pop out of the ground. Even the crocuses (which bloom early) are just getting started. It's just going to be a late spring. I can only hope that Summer will be LATE also. First Meems, I like your new digs. The new background is a perfect eye catching complement to your subject matter, yet not too intrusive like they can sometimes be. I like your attitude. It's a "bloom where you're planted" mentality that is rare but vital to our sanity. After all in a world where we can control so much of what goes on around us, the weather is still unreachable. Your winter will be one for the books. This is sooo pretty! You have the best blog in the world. It is a joy to visit!! I know it has been pretty wicked for everyone this winter. Let's do hope summer delays ... that would be just lovely by me. Thanks for noticing ... I'm glad you like the switcheroo. Well, I'm definitely not completely 'there' yet, but let's just say maturity is good for more than just losing gravity. Awww... that's a very sweet thing for you to say. If I lived in Miami I would have cut everything back already too. I'm sure you would never have believed freezes would be threatening in March. Geez, I can't believe it. 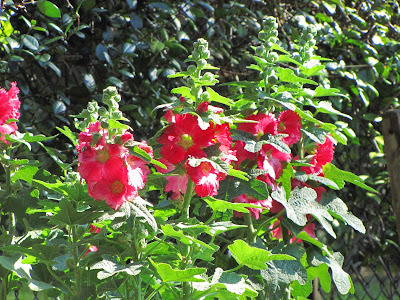 are those red hollyhocks blooming in your last photo? and when did you acquire those? and where in your garden spaces is the plant located? don't remember seeing them, so maybe they are in the new berm? are they cold-hardy? love the look! Having critters make parties while winter is going on in your climate would be another aspect of gardening I've not had to deal with... I guess since I am out and about in the garden year round they don't get the chance to make it their home. Yay for the sunshine and for plant replacement when necessary... none of it... as you say is the end of the world.